Architects SmithGroup and TRO Jung|Brannen, Inc.
Approved renovation and expansion of Boston University's existing Goldman School of Dental Medicine (GSDM) in the South End. A new 7-story, 41,900-square-foot addition to the existing 7-story, 84,200-square-foot GSDM building will be constructed, expanding the GSDM to 126,100 total square feet. The addition will rise seven stories along the northwest edge of the existing building and one level along the northeast edge of the existing building. Approximately 53,100 square feet of the existing building will be renovated, bringing the GSDM in line with Boston University's modern vision and improving accessibility. An existing one-story cafeteria will be demolished in order to construct the new addition. The resulting GSDM building will feature office, instructional, clinical, and student collaborative space, incorporating the latest technology and creating multi-functional learning space. As part of the proposed project, the building's exterior will be fully modernized, featuring a new terra-cotta and glass curtain wall facade. The project will be constructed across three phases over 39 months optimizing the use of the building for classes and patient treatment throughout construction. Construction of the project is expected to commence in early January 2018. The new addition will be constructed first, followed by the renovation of the existing building. Completion of the project is expected in Spring 2021. Shawmut Design and Construction hosted a topping off ceremony last Friday for the $112M renovation and expansion of Boston University's Goldman School of Dental Medicine. The project includes a new 7 story 41,900 square-foot expansion and renovation of 53,100 square-foot of existing space. The new and renovated space will feature office, instructional, clinical, and student collaborative space, incorporating the latest technology and creating multi-functional learning space. The building's exterior will also be fully modernized, featuring a new terra-cotta and glass curtain wall facade. Construction on the first phase of the project is expected to be complete in February 2021. Various stages of construction are ongoing for the addition and renovation of BU's Goldman Dental School. Work continues on the new patient entrance and porch while foundation work is also being completed for the 7 story addition. The addition to the school will add nearly 42,000sf to the existing building. This project will feature office, instructional, clinical, and student collaborative space, incorporating the latest technology and bettering the patient experience. Installation of the new building foundation system continues for the addition and renovation at Boston University Goldman School of Dental Medicine. The project will add a new 7-story addition to the existing building to better the patient experience and incorporate the latest technology for students. Utility work on Albany Street, from the GSDM building to 650 Albany Street, will continue on Saturday and Sunday in line with City of Boston permits. On Saturday, flooring in the GSDM building will be replaced in the area around room 704F. The flooring work is associated with the previously completed work to add a door to room 704F. The pile-drilling operation between GSDM and the Boston Medical Center/Newton Pavilion was completed last week. The pile-drilling will resume at the north elevation along the loading dock to Newton Pavilion in a few weeks. Installation of the earth-retention system (SOE) will continue between GSDM and Boston Medical Center/Newton Pavilion. The equipment used to vibrate the SOE sheet pilings (required for installation) will be completing this operation as it heads toward East Newton Street. As a result of unanticipated work stoppages, this work will now continue through 7/3/18, pending weather and project scheduling requirements. The project’s structural steel subcontractor will continue to install the clips for the existing GSDM exterior walls. (The clips are used to secure the steel framing to the building for the new entrance canopy.) Following this operation, installation of new entrance-canopy structural steel is scheduled to begin on Monday, 7/2/18. Excavation of the soil between the sheet piling and the foundation of the former cafeteria will begin. This is the first step towards removing the building’s existing foundations to allow the new addition support piles to be installed. Saw-cutting at the existing GSDM foundation along Albany Street will take place in order to connect the new foundation system (for the future entrance canopy) to the existing building.Installation of new piping and duct work to support the school’s mechanical systems will continue in the basement and on the first floor. Pile-drilling continues around the perimeter of the existing GSDM building, including on the Boston Medical Center loading dock side of the building on the north, and on the west side of the building (between GSDM and the Boston Medical Center/Newton Pavilion) for the 7-story addition. Utility work on Albany Street continues, from the existing GSDM building on towards 609 Albany Street. Investigation and rerouting of utilities around the site, allowing the installation of the earth-retention system (SOE) is being performed. Additionally, work on the new foundation system will continue along the East Newton Street side of the building in preparation for the first concrete installation in Phase 1. Interior demolition activities are ongoing in the basement and on the first floor of the School. Pile-drilling will continue around the existing GSDM building, on East Newton Street, Albany Street, and on the Boston Medical Center (Newton Pavilion) loading dock side of the building. Interior demolition activities will continue in the basement and on the first floor of the School. Investigation and rerouting of utilities around the site will continue. Unmarked utilities—that is, those not previously recorded on earlier building plans, but discovered during excavation and trenching—are being assessed, causing a slight delay on the start of installation of the earth-retention system (SOE). The project team is working to relocate these utilities and anticipates SOE installation during the week. Continued infrastructural work on the relocation of the traffic signal at the corner of Albany Street and East Newton Street. (Weekend work, as directed by the City of Boston, reduces the impact on traffic.) Eversource will be on-site to provide power to the temporary signal. The existing signal will remain active until the temporary signal is operational. installation of the handicap lift at the School’s East Newton Street entrance will continue. Testing and State inspection will follow over the next week before the lift is officially available for public use. This is an important milestone as it will allow the existing handicap ramp to be taken offline and demolished to clear the way for the new addition’s footprint. A tent will be set up on the construction site in the space between the School and the Newton Pavilion, and other preparations will be made for the project’s Groundbreaking Ceremony to be held on April 5. Investigation of the routing of the building’s existing utilities will continue, and utilities presently serving the former cafeteria will be disconnected to prepare for its demolition in the coming weeks. Construction personnel will continue to be on site (inside and out) to prepare for the cafeteria demolition and the start of construction of Phase 1 in the School’s basement and first floor. Construction of an overhead canopy at the East Newton Street entrance will begin. It will provide cover for pedestrians as they enter the building, as well as protection for the handicap lift. The reworking of the East Newton Street entrance vestibule will begin, including the construction of a temporary storage room, along with the slight relocation of the security desk in the vestibule. The Boston Fire Department’s emergency connection to the building on the Albany Street side will be extended so that the connection point is outside of the construction fencing. Investigation of the routing of the building’s existing utilities will continue, and utilities presently serving the former cafeteria will be disconnected to prepare for demolition in the coming weeks. Construction personnel will continue to be on-site at the interior and exterior of the building to prepare for the cafeteria demolition and the start of construction of Phase 1 in the School’s basement and first floor. Renovation and expansion of Boston University - Henry M. Goldman School of Dentistry. The work will include; new fire alarm's, MEP upgrades, sprinkler work, architectural finishes and landscape work. Interior renovation of 1st, 5th, and 6th floors. The expansion will consist of a 2 story addition to the northside and a 7 story addition to the westside. There will also be exterior facade upgrades to the existing building. 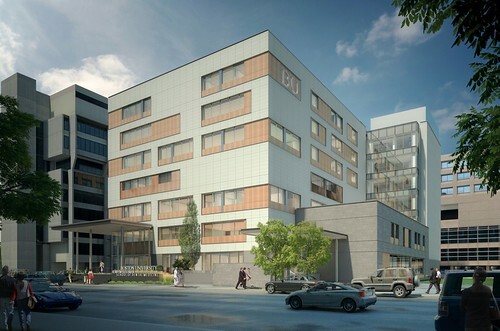 The Boston Planning & Development Agency (BPDA) approved the renovation and expansion of Boston University’s Goldman School of Dental Medicine (GSDM) in the South End at last Thursday’s board meeting. The existing 7-story, 84,200-square-foot GSDM building will be renovated, and a new 7-story, 41,900-square-foot addition will be constructed, expanding the GSDM’s total floor area to 126,100 square feet. The expanded GSDM will include office, instructional, clinical and student collaborative spaces. Construction of the project is expected to commence in early January 2018, starting with construction of the addition followed by renovation of the existing building. Completion of the project is expected in Spring 2021. The project will require additional approval by the City of Boston’s Zoning Board of Appeals (ZBA) in order to proceed with construction. Boston University proposes to renovate its' existing Goldman School of Dental Medicine in the South End and construct a new 41,900-square-foot addition, expanding the building's total area to 126,100 square feet. The university has filed plans for the project with the Boston Planning & Development Agency (BPDA), who is now reviewing the proposal.